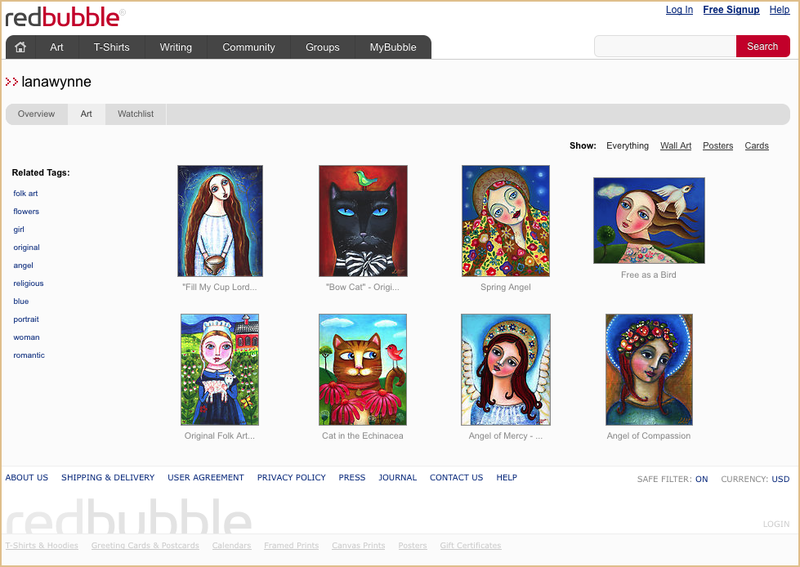 As an artist that is also a Stay Home Mom of two little girls and is also homeschooling them I find that selling my art online on websites like the Red Bubble Art website is the easiest way to do it. It allows me to have such a larger audience. To go to an art show of any significance I would have to drive 2 hours one way and then you would not be sure how successful the show would be. Don’t get me wrong, I do love the interaction with other artists but like many, my time is very tight. As a result I have found selling my art on the Internet rather rewarding. With my two daughters we are all able to sit around the table for the better part of the day doing home school and creating art. My daughter Marianna is eight years old and loves to draw as well. My husband that has worked with website development has helped us girls out tremendously by setting up our blogs. If you wanted to see Marianna’s blog you could go to www.MariannaWynne.com My other daughter Elizabeth is only two and although she has a website she is not working on it yet, lol. So I have found the Internet a great place to sell my art. The websites that I get the most sales from is Etsy, Red Bubble and Ebay. In this article I wanted to share about the Red Bubble Art website. I have been creating art for many years and now with the ease of the Internet I looked into how to sell online and many of the artists that were selling online had their work listed on the Red Bubble Art website. To set up an account with Red Bubble is easy and free to do. As I am learning from my husband you always want to keep in mind how search engines index websites on the Internet. This is called SEO or search engine optimization and is very important. I wanted to make sure that I owned many of the important websites for marketing with my name, lanawynne. Websites like Twitter, Facebook and YouTube. To get started on Red Bubble you just need to visit their website and create an account. This is like any other standard website requiring your personal information to get started. Once you have your account set up I recommend that you go through all the options to complete your account as much as possible. You will do this by clicking on the MyBubble on the top tabular menu. After clicking there you will see a number of options down the right hand side of the page. They are listed as Edit Your Profile, Change Your Portrait, Edit Your Address, Connect with Facebook, etc… Taking the time to complete your account now will insure that you don’t start listing without your information being correct and complete. Once you have the account set up it is time to start listing your work, which we will cover in the following article. I created this folk art “Fill My Cup Lord” being inspired by the well-known hymn, “Fill My Cup Lord”. There are so many times that we feel empty and God is the only One that can fill our emptiness. When He does fill it He does not use transient material but Love, Joy, Peace and many other wonderful items. This painting sold right away on Ebay. Original folk art painting done on an 8×10 stretched canvas with acrylic paint. I created this original folk art painting entitled, “Bow Cat” with the imaginations of a cat being elegant while he is hunting his prey. This is an original folk art painting that I did with acrylic paints exclusively on a stretched 8″x10″ canvas. This painting is sealed with protective matte coating and all of the sides are painted black. Note: Color may vary slightly due to different computer monitor color settings. 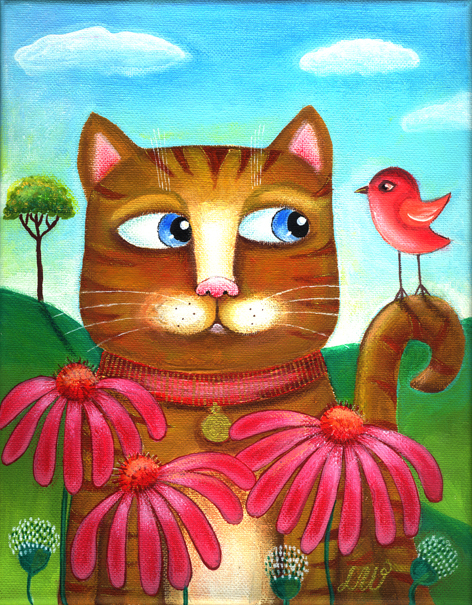 I created this folk art “You like Echinacea too?” being inspired first by cats and second by herbs and their potent ability to help us heal our bodies, Echinacea being one of my favorites. Original folk art painting done on an 8×10 stretched canvas with acrylic paint, oil pastels and colored pencils. 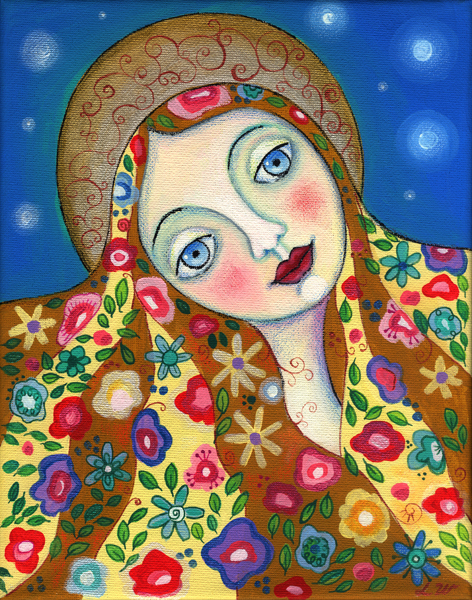 I created this folk art “Angel of Compassion” being inspired constantly by angels. After having created this portrait I looked at her face and felt, compassion. Original folk art painting done on an 8×10 stretched canvas with acrylic paint, oil pastel and archival ink. 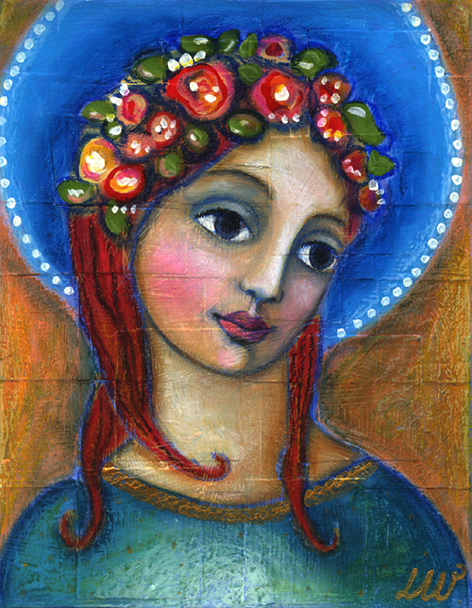 I created this folk art “Spring Angel” being inspired by the rebirth of all the earth this year. It sold right away on Ebay. Original folk art painting done on an 8×10 stretched canvas with acrylic paint and archival ink. 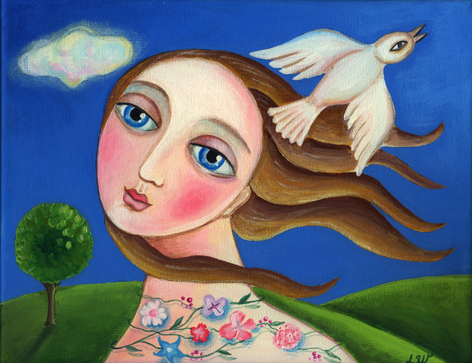 I created this folk art painting “Free As A Bird” as an expression of my personal desire for Freedom. There are a lot of things that we need to be free from.